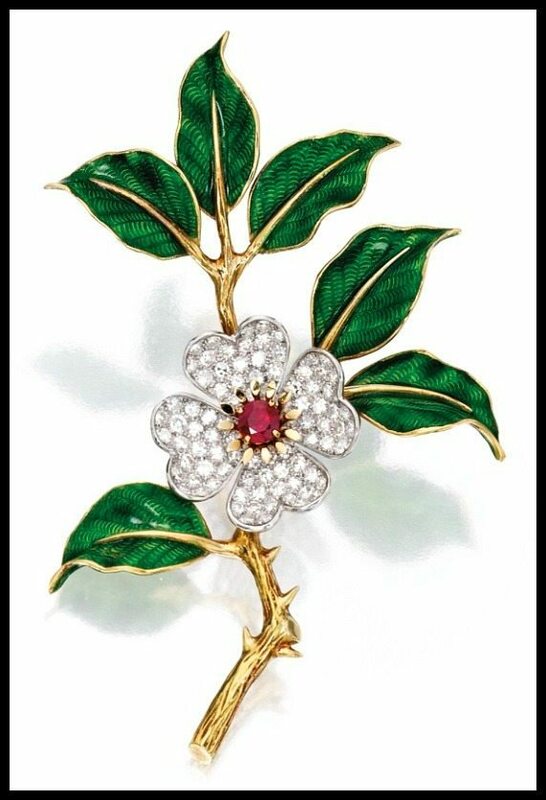 You are here: Home / Jewelry / Brooches / Lovely dogwood flower suite by Boucheron, Paris. 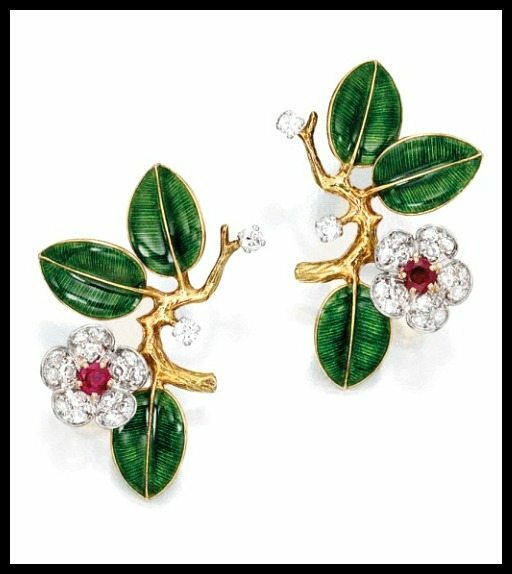 Lovely dogwood flower suite by Boucheron, Paris. I associate dogwood flowers with my parents house. There was a low-hanging, flowering dogwood in the backyard that I always used to imagine was my house when I was back there playing pretend. They’re such a beautiful, subtle flower, too; the delicate color with the clean lines of the petals. The entire suite comprises approximately 8.75 carats of diamonds and 16 round rubies. My favorite part, though, is the carefully worked golden branches; the texture of the gold and the lines of the silhouette. Here’s a closer look at the necklace. 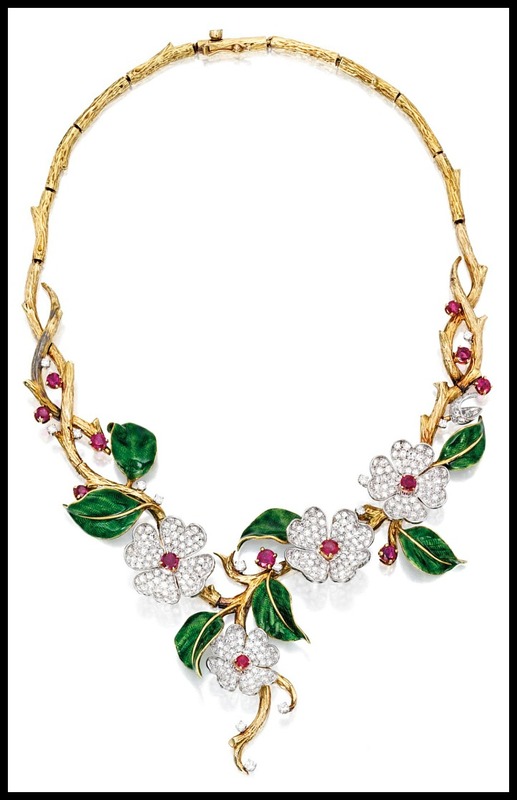 It’s 16 inches long, so one can imagine the leaves and blossoms would fall beautifully along the wearer’s collarbone. You see what I mean about the lines of the branches? 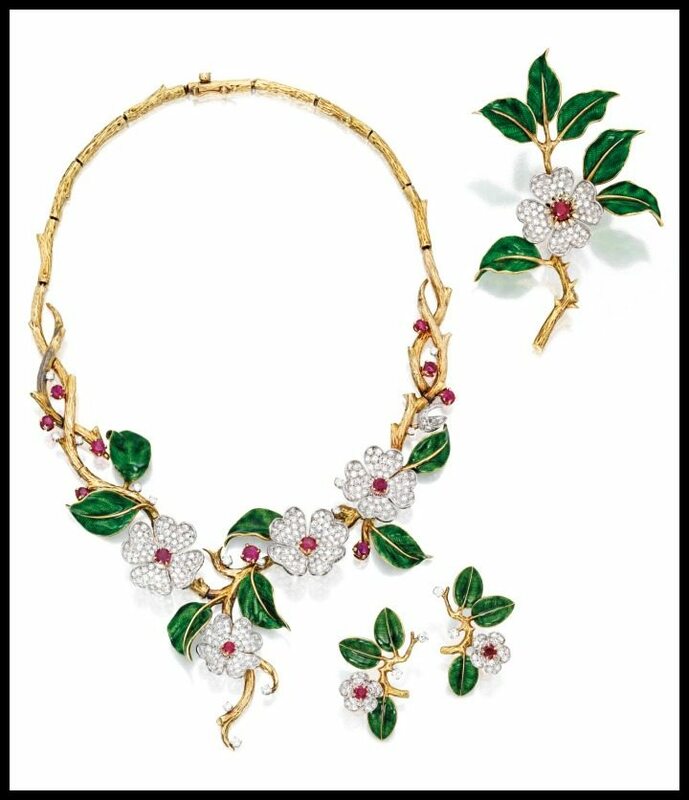 Boucheron really made this piece feel organic. The Sotheby’s description doesn’t specify that these are supposed to be dogwood flowers, but I’m pretty sure they are. Here are the earrings. I wonder how they attach; the description doesn’t specify. I hope they’re posts, I think that would be beautiful. I bet they’d work as clips, too. Here’s a brooch. This piece gives a great view of the dogwood flower itself. I love the golden detail around the center of the flower. The dogwood flower motif isn’t showy, but I that’s part of what I love about this suite. It’s easy to make roses or orchids look extravagant. I enjoy seeing a humbler flower rendered in gems. On that note: do you think I’m right? These look like dogwood, don’t they? Or do any of you think it looks like something else? 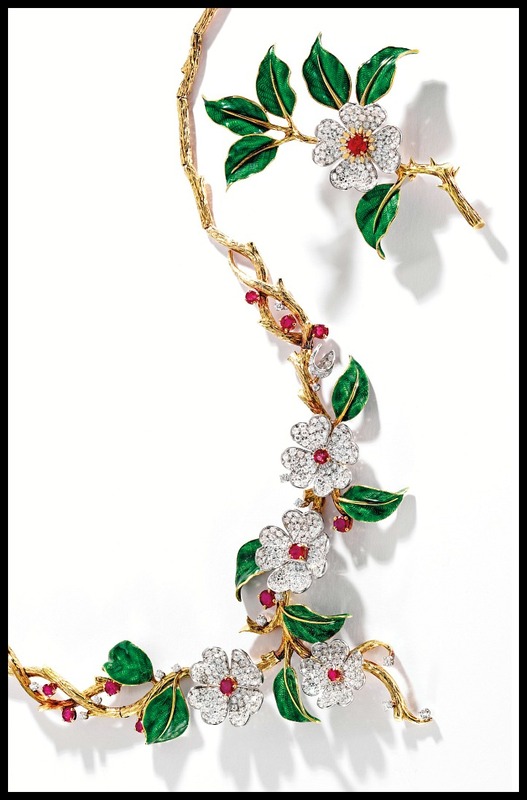 This dogwood flower suite by Boucheron was listed in a February 2014 Sotheby’s auction. All images and info are thanks to Sotheby’s. Yep, I agree that they’re dogwoods. We had one in our backyard and many others in our woods (state tree of MO!) when I was a kid.